FlashDisk HX-2U24 – Winchester Systems FlashDisk HX-2U24 High Performace Hybrid Disk Array delivers 500K Random IOPS and 12 GB/s data throughput. FlashDisk HX Rear View – Shows universal ports that accept SFPs for 8 Gb & 16 Gb Fibre Channel and 10 Gb Ethernet. The unit supports simultaneous multi-protocol access and protocols are easily changed with SFP swaps. FlashDisk HX – Front View – Shown with one 3U, 16-drive expansion shelf. Now get the performance of all flash arrays in a hybrid array that uses a modest number of SSDs to accelerate the performance of the standard hard disks with the newest 14th generation FlashDisk array. Customers have told us they love the all flash arrays but they are still expensive for SMB budgets. Now IT managers can have the best of both worlds: The speed of flash at hard disk prices. SSDs in the base unit are assigned for read caching to accelerate performance of all the hard disks. For write intensive applications or data hot spots, SSDs can be assigned to dedicated volumes. Now it is possible to keep costs low and take advantage of flash memory to get the speed at reasonable cost. FlashDisk HX is ideally suited for virtualized environments, transaction, database, financial, manufacturing and other random access applications that may be speeded up by a factor of ten or more. These faster controllers also more than double the throughput or the prior generation to 12 GB per second allowing faster backup and restore, video or surveillance applications and other sequential processes to run at superior speed. Plus it supports more VMs in a virtualized environment. FlashDisk HX supports up to 14 expansion chassis that can hold (16) 3.5” HDD/SSDs with a maximum of 240 drives total for a maximum capacity over 1.9 PB. This 14th generation FlashDisk expands controller cache eight-fold to 256 TB maximum, to support high speed across all the storage using the fastest DDR-4 memory. Optimized for performance, FlashDisk HX delivers performance for all of your application in a single, affordable and expandable system. With up to 16 host ports, FlashDisk HX creates a local HyperSAN where up to 16 servers can be directly connected via Fibre Channel or SAS without the cost and complexity of external SAN switches. It supports up to (16) 8 Gb or up to (8) 16 Gb Fibre Channel ports or up to (8) 12 Gb SAS ports. It also supports 10GbE and 1GbE ports for high performance LAN configurations. New to this generation of FlashDisk is a universal port where the system interconnects can be change just by plugging in different SFP connectors – without changing anything in the FlashDisk system itself. This provides tremendous flexibility for future redeployments and protects your storage investment. The FlashDisk HX has a robust set of enterprise-class data services including: snapshots, thin provisioning, remote replication, SED encryption and more. 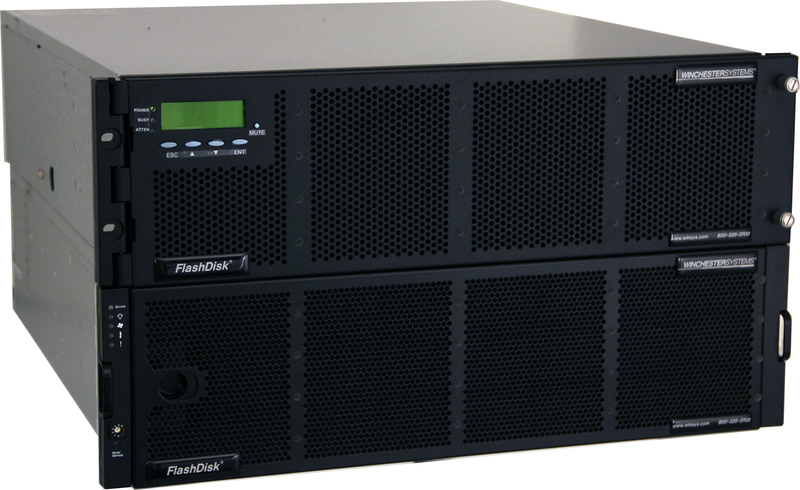 With the management simplicity of an appliance – the FlashDisk HX is easy to deploy and support. FlashDisk HX is compatible with all virtualized environments, industry standard operating systems and industry standard clusters. Leveraging 20+ years of RAID controller experience, the FlashDisk HX offers fully redundant, hot-swappable controllers, fans, PSU’s and drives. A 10-year “super capacitor” replaces 3-year batteries and NVRAM preserves cache data without power on. With proactive SSD wear level monitoring, email notifications and backed by Winchester Systems world-class support – data is always safe. FlashDisk HX is designed to provide all flash performance at hard disk prices. The only added cost compared to standard hard disk array is the costs of a few SSDs. Now you can move applications to a new level of performance for little added cost and avoid the big step up to the cost of all flash arrays.